SpaceX has today received its first crew mission order from NASA, making it the second private spaceflight company to be granted a contract to launch NASA astronauts from the US into the Earth's lower orbit. 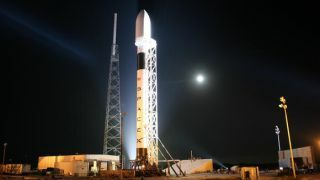 SpaceX will be expected to use its Crew Dragon capsule, which can carry up to seven people, to ferry NASA astronauts to the International Space Station (ISS), marking the second in a series of four guaranteed orders from NASA. Boeing, which has just begun developing its CST-100 Starliner spacecraft, was granted the contract earlier this year in May under NASA's Commercial Crew Transportation Capability (CCtCap) contracts. "It's really exciting to see SpaceX and Boeing with hardware in flow for their first crew rotation missions," said Kathy Lueders, manager of NASA's Commercial Crew Program. As NASA doesn't currently have its own manned spacecraft, and is hoping these commercial contracts will mean that the space agency will no longer have to rely on the Russian Federal Space Agency's Soyouz rocket to take US astronauts up to the ISS. "Commercial crew launches will reduce the cost, per seat, of transporting NASA astronauts to the space station compared to what the agency must pay the Russian Federal Space Agency for the same service," NASA explained. However, NASA still requires funding to be approved for these contracts next year, otherwise future manned missions will be delayed. If it is approved, however, each contract includes a minimum of two and a maximum six missions, with a standard commercial crew mission to the ISS to carry up to four NASA astronauts or sponsored crew members as well as 220 pounds of pressurized cargo. The spacecraft will then be required to stay at the ISS for up to 210 days, to be made available as an emergency lifeboat if needed. It's currently unknown if Boeing or SpaceX will become the first commercial company to launch US astronauts into space, but NASA is hoping to schedule a launch for sometime in 2017. According to NASA, mission orders are given two to three years before a launch, giving contract holders time to build their launch rockets and spacecrafts. Once manufacturing is complete, each company will need to complete a certification process before final flight approval is given by NASA. "Commercial crew launches are really important for helping us meet the demand for research on the space station because it allows us to increase the crew to seven," said Julie Robinson, International Space Station chief scientist. "Over the long term, it also sets the foundation for scientific access to future commercial research platforms in low- Earth orbit."